Here's another simple yet amazing dropdown menu with pure CSS3 made by Andrew from script-tutorials.com with some slight modifications so that it can be easily adapted to our Blogger template. In the upper right side of this menu, we have the contact links and social media icons for Facebook, Twitter, Google Plus and RSS feed. Below these links, there is the drop-down navigation menu and on the left side, the search form. To achieve a better user interface and interaction, the CSS dropdown menu features sub categories that appear with a nice touch of CSS3 box-shadow, text-shadow and a cool transition once the parent link is activated by a hover selector. Step 2. Next, click anywhere inside the code area and press the CTRL + F keys to open the search box. Type the tag below inside the search box and hit Enter to find it. Replace the # symbols with the URLs of your links and replace the texts in blue with the titles that you want to appear in the menu. To change the social media icons, add the links of your icons instead of the ones in blue. For more help, please see this tutorial on how to upload and get the URL of an image. Step 6. Click on the "Save template" button to save the changes and you're done! 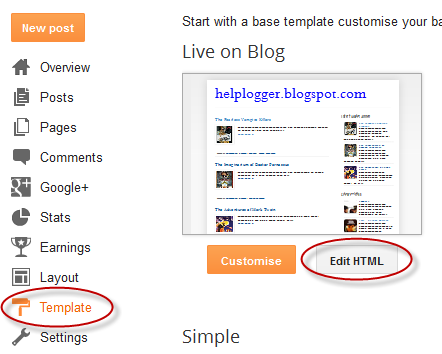 Hope you like this CSS3 dropdown menu for Blogger and if you enjoyed the tutorial, please share and subscribe. hi admin. i sent you email through your contact pag. plz reply me. i'm waiting. Thanks for the post. It's great. how to change the front? can you teach me? And change arial with the name of the font. Dear admin, I have tried this menu style on my website, it looks really well thanks to you, but, it has a minor mistake, whenever I click on any other page except home page, the link of the page opens, but on the menu, the page highlighted is still the home page. Same goes for all the other pages, the link is opened but the highlighted page is still the home page. Can you help me with it? Please reply if you have a solution. Rawaha Muhammad, I agree with you. Also on mobile or tabs it doesn't work. There should be a function for mobile like they should open their dropdown when a person touches menu buttons on mobile phone.you can chek my blog link on comment name "Read Quotes" and can try it on mobile. Please solve this issue. Thnx a lot!!! :) usefull!! Hi Admin, If I have some menu like that MAIN MENU>>SUB MENU>>SUB-SUB MENU . What should I do please help . Hi Admin, please help. I want to add some menu under sub menu. I am trying with < ul > < li > < a href = ' # ' > Menu 1.1.1 < / a> < / li > < / ul > this code. It doesn't .... If it is not possible then you please provide new new code for me. How to display the drop downbar when browsering by mobile?? How can we change the blue colour? I want to add this colour for hover #00dafe ..... And the background, instead of white can we make it black? Also, when I go to a different tab, the home tab stays coloured. Example: I select the 'XYZ' tab. The page loads, but the home tab stays selected in blue and the XYZ tab is white. How can I make them all look same no matter which is selected? Can you help me making this widget float and changing it's color!! ?